Palestinian factions from across the political spectrum are celebrating the latest terrorist bombing of a bus in Jerusalem on Monday afternoon. An explosive device planted on the bus wounded 21 people, including two in serious condition, and set fire to another bus and nearby vehicle. An armed Fatah-affiliated group praised the attack, claiming that the bombing ushers in a new phase for the Palestinian terrorist uprising, reports journalist Khaled Abu Toameh. Abu Toameh also tweeted a photo showing employees of Hamas' al-Aqsa TV channel rejoicing over the terrorist attack and holding a tray of celebratory sweets. Other Palestinians in Gaza also celebrated the bombing, handing out candies and sweets in the streets. 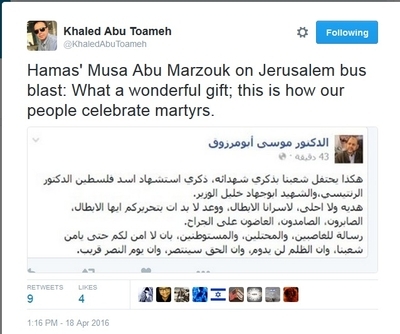 Moreover, senior Hamas official Mousa Abu Marzook glorified the attack on his official Facebook page, calling the bombing "a gift...for our heroic [Palestinian] prisoners," according to a translation by the Investigative Project on Terrorism. "A message to the usurpers, the occupiers, and the settlers, that you will have no security until our people are secure, that injustice will not last, that right will prevail, and that the day of victory is soon," Abu Marzook wrote. These are the words and threats from a leader of a designated terrorist organization that notorious U.S. Islamists – including Linda Sarsour – treat as a legitimate political party. As we often say, imagine if the roles were reversed and Israeli political officials celebrated a terrorist attack targeting unarmed Palestinians. It would dominate the news for days on end and the international community would leap to condemn the bloodthirsty sentiment. But when it comes to attacks targeting Israelis or Jews, statements by Palestinian officials glorifying terrorism gets limited to no traction in the media. In response to the attack, Israeli Prime Minister Benjamin Netanyahu declared: "we will find whoever prepared and dispatched the explosives, as well as those who helped them. We will settle accounts with those terrorists."